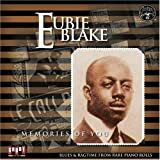 Eubie Blake , born to former slaves, enjoyed a long career as pianist/composer, vaudevillian, and writer of successful Broadway shows. He was a natural talent who was surrounded by music as a child and received some early piano training. But at the age of 63, after a distinguished career, he studied composition and received his degree from NYU. Ragtime was in its heyday after the turn of the century and had a considerable white audience. Blake brought a new sophistication to the art form and published several rags, although his most famous, “Charleston Rag,” written in 1899, wasn’t published until 1919. He formed a partnership with vocalist/lyricist Noble Sissle 1915, and they performed on vaudeville as the “Dixie Duo.” Their first song, written that year with Eddie Nelson, “It’s All Your Fault,” was introduced by Sophie Tucker and became a hit. In 1921 they brought to Broadway the first all-black musical, Shuffle Along, the first to be written, produced, and directed by blacks. It was unique, also, because it contained the first love song to be sung between two blacks. The show was long running, and “I’m Just Wild About Harry” was a big hit. Blake continued his many-faceted career until 1946 when he retired. However, he recorded an album in 1969 that renewed his popularity. In 1978 Eubie, a musical based on his life and songs, opened on Broadway. He also saw his face on a postage stamp, was awarded the Medal of Freedom in 1981, and gave his last performance in 1982 at age 99.